I'm all verklempt about my girl being nominated last night. Have been waiting way too long to see a major party nominate a woman for president, and with it being a woman I've long admired and see myself in, it's all the sweeter. So in honour of that historical accomplishment, here's another ground-breaking woman, Sophie Kurys, the "Flint Flash". 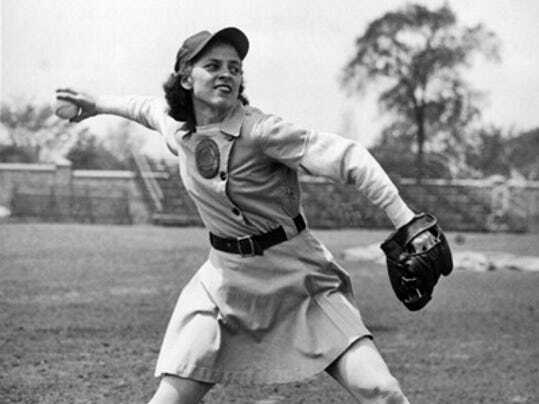 She swiped 201 bases in 203 attempts in 1946 - in a skirt! (Take that, Gibby!) Kurys' single-season record of 201 stolen bases in 113 games surpasses the MLB record of 130 set in a 162-game season by Rickey Henderson, then with Oakland, in 1982. Her best season, she reached base 215 times while hitting a .286 batting average with league-leads in runs (117) and on-base percentage (.434). She also set season-league records with 93 walks and for fielding percentage for her position at .973. 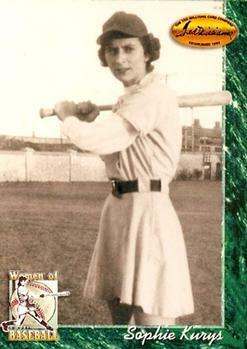 She was also the top hitter in the playoffs and stole five bases in the 16-inning, title-winning Game Six against the Rockford Peaches, where she singled in the bottom of the 13th, stole second, then hustled home with the winning run on an infield hit when she slid hard into home plate away from the tag. She was named Player of the Year. "They wanted us to look like Marilyn Monroe and play like Joe DiMaggio," Kurys told the Associated Press in 2003. Her bare legs were often purple in the cold Chicago air, or black and blue from sliding into home bare-skinned. They played on gravel infields. In total, she holds the all-time records for stolen bases (1,114), runs scored (688), runs in a single game (five) and in a regular season (117). She also is third in lifetime hits (859) and walks (522). 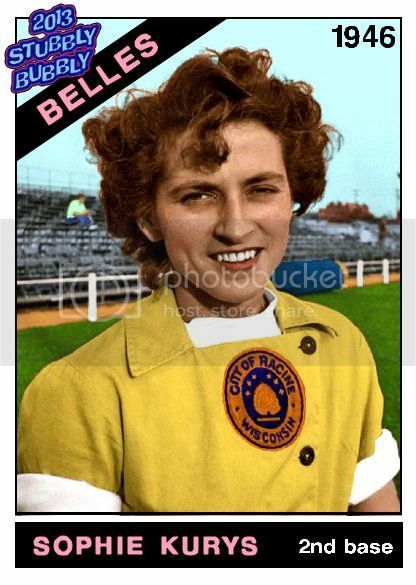 A second baseman, she spent her entire career with the Racine Bells, who moved in her final season to Battle Creek. After the league folded she played softball for a few years, then became a secretary at a machine parts factory while remaining in Racine. She eventually became vice-president, then retired to Scottsdale, Arizona, where she died in 2013 at the age of 87. (Comprehensive obits here and here.) She had been a track star as well during her teens, a talent that served her well in her pro career. If you don't know about the women's leagues, everything has been documented here.